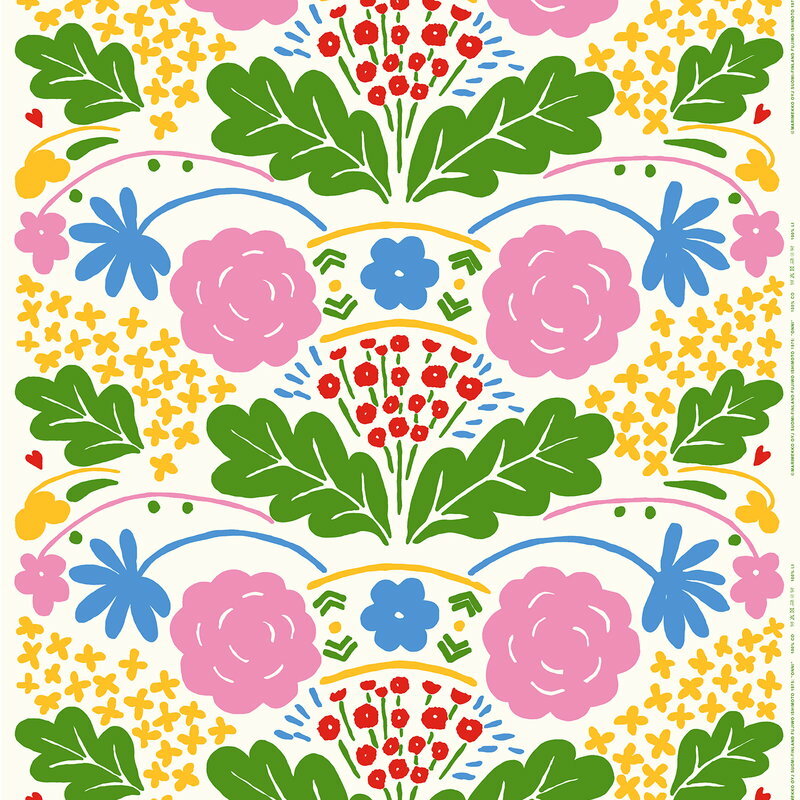 Marimekko’s Onni fabric is adorned with a joyful plant pattern inspired by folk art. Onni, Finnish for happiness, was drawn by Fujiwo Ishimoto in 1975. 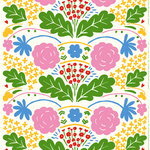 Made of 100% heavyweight cotton, the fabric has been printed in Helsinki, Finland. Fujiwo Ishimoto (b. 1941) is a Japanese-born textile and ceramic designer. Fujiwo Ishimoto joined Marimekko on a permanent basis in 1974. He had previously worked for four years in various capacities for the Décembre company, which was involved in the design and production of Marimekko’s canvas bags, among other products. In Tokyo, Fujiwo Ishimoto had seen fabrics designed by Maija Isola in the 1960s, and he was so impressed by them that he decided to travel to Finland to find out what Marimekko and Finnish design was all about. Among the others, he has designed for Marimekko the Ujo towel collection, a classic of Marimekko’s terrycloth line. As a ceramic designer, Fujiwo Ishimoto has created unique ceramics art works in the Arabia Art Department since 1989. That same year he received Arabia Cultural Foundation’s scholarship. Ishimoto’s works are inspired by the surrounding nature with its phenomenon. The forms of his works are minimalistic and combined with lively exterior structures and generous decorations. Ishimoto has received among other prizes the State Industrial Arts Prize, Kaj Franck Design Prize and Honourable mentions at Finland Designs exhibition in 1983, 1989 and 1993. In 2011 he was awarded with the Pro Finlandia Medal. His ceramics and textile works have been to several private and group exhibitions. Fujiwo Ishimoto has also made stage settings and costumes for operas.